November 1, 2001: Cosmologists speculate that 1014 years from now (a mind-boggling stretch) the stars in our relentlessly expanding Universe could run out of fuel and fade from view. The night sky, once the TV set of ancient peoples, will become dull and boring: a blank tableau with no stars or nebulae. Sounds like an astronomer's nightmare! Fortunately, the stars themselves won't go out for a very long time. But researchers say the night sky is already fading. A recent study revealed that perhaps two-thirds of the world's population can no longer look upwards at night and see the Milky Way -- a hazy swath of stars that on warm summer nights spans the sky from horizon to horizon. Above: The Milky Way shines through aurora borealis during a recent geomagnetic storm. Both are rare sights from brightly-lit urban areas. Photo credit: Duane Clausen, Menominee, Michigan, USA. The Milky Way is dimming, not because the end of the Universe is near, but rather as a result of light pollution: the inadvertent illumination of the atmosphere from street lights, outdoor advertising, homes, schools, airports and other sources. Every night billions of bulbs send their energy skyward where microscopic bits of matter -- air molecules, airborne dust, and water vapor droplets -- reflect much of the wasted light back to Earth. "It's hard to imagine that the incandescent electric lamp was invented little more than 100 years ago," says George Eslinger, former Director of the Los Angeles City Bureau of Street Lighting. "Since then urbanization and poorly controlled lighting has created a severe light pollution problem in industrialized countries." "If we don't reverse this trend," he cautions, "the entire globe will soon be wrapped in a glowing envelope through which none of the magic of the Universe can be seen by the naked eye." City dwellers have already lost most of the constellations, the planet Saturn, and a host of medium magnitude stars. They can forget about observing most meteor showers, too, or faint displays of Northern Lights. It's a big loss. Young sky watchers grow up to be philosophers, scientists, poets, explorers, and school teachers. But kids aren't likely to watch -- or be inspired by -- a blank sky. Timothy Ferris, author of 10 best-selling books on astronomy and the cosmos, and featured scientist in the PBS special "The Creation of the Universe" agrees, "The loss of the night sky is most troubling for children. Whole generations of kids in cities and suburbs are growing up seldom if ever having seen the Milky Way and what a sky full of thousands of stars might look like." That's a shame because most humans seem to have a deep-seated interest in astronomy -- a longing to stare at the stars and learn about the heavens. It's what professional astronomers call, fancifully, our astronomy "gene." Says Ferris: "All human cultures no matter how primitive have felt it important to tell stories about the stars and about the nature and the origin of the Universe as a whole. So there's something about astronomy that is deeply engrained in human culture, going as far back as music, dance and poetry." That ancient call from the stars is one reason why modern folk visit planetaria. But can such exhibits replace the real night sky? "No way," says Marshall Space Flight Center astronomer Mitzi Adams. "Even the best planetaria cannot demonstrate the true scale of the night sky. I remember when I worked at the Fernbank Science Center's planetarium in Atlanta: I was exposed to the planetarium's artificial sky many times a day. One week the weather in Atlanta was bad and I hadn't seen the 'real' sky for a while. Finally one evening the clouds parted and I walked outside. I was astounded by the size and beauty of Orion. It was the real thing and I could tell the difference." Adams could see Orion from Atlanta because it is one of the brightest constellations. But even brilliant Orion will eventually fade if poorly-designed lights proliferate. Fortunately, light pollution is reversible. In recent years engineers have developed more efficient bulbs with "sky friendly" fixtures that can preserve dark skies and decrease energy costs. "Consider home security lights," continues George Eslinger. "The $19.95 variety often put more light into the air than they do on the ground. But by using the proper fixture, properly aimed, we can eliminate glare, eliminate shadows against buildings where 'bad guys' can avoid detection ... and do it all with less energy." Exterior home lighting is a primary source of light pollution in some areas, but not all, adds Eslinger. Street lamps, sports fields, billboards and parking lots -- even prison lights -- can be the biggest offenders. "The sources of light pollution are as varied as each community or region," he says. GOOD Post-top ornamental fixtures can minimize light pollution via a lamp reflector located above the bulb. GOOD Flat-lens cobra head fixtures provide excellent roadway lighting with greatly reduced glare and no uplight. BAD The ubiquitous drop-lens cobra head luminaire produces a level of glare and uplight that is both unacceptable and unnecessary. That variety makes the job of the International Dark-sky Association (IDA) particularly difficult. IDA was formed in 1988 by a group of concerned sky watchers who wanted to combat light pollution. "Our goal," says Eslinger, who is a member of IDA's board of directors, "is to educate the public regarding the indiscriminate use of light and the benefits of choosing the right light to do the job." As awareness grows, they hope, communities and individuals will choose sky-friendly, energy-efficient lighting -- and light pollution will subside. It's a daunting problem: thousands of communities with billions of light bulbs, all aglow. Fortunately, the stars are still out there shining bright -- patiently waiting for us to turn down the lights. You can learn more about light pollution and its remedies from the International Dark-sky Association website: http://www.darksky.org. Dark Sky Quotes: - find out what educators and scientists have to say about the loss of Earth's dark skies. Lighting Up the Ecosphere -- (Science@NASA) Using satellite images of city lights at night, NASA scientists are mapping the spread of urban areas around the globe and monitoring their impact on our planet's ecosystem. Study details growing problem of light pollution (SpaceFlight Now) the increasing use of artificial lights has wiped out clear views the night sky for hundreds of millions of people. Fred Schaaf's Light-Pollution Notes -- (Sky & Telescope) a collection of links and essays about light pollution. A Milky Way Primer - Can't see the Milky Way? Find out what you're missing! 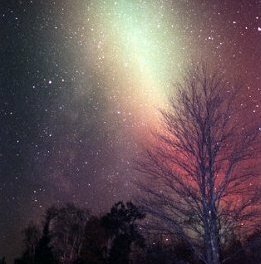 Light Pollution Prevents Seeing the Milky Way -- a Goddard Space Flight Center "Science Question of the Week."